The holidays are a busy time, what with winter weather, extra guests and a thousand things on your to-do list. Remember to carve out time for the people you care about most, including yourself. INDULGE YOUR INNER CHILD. 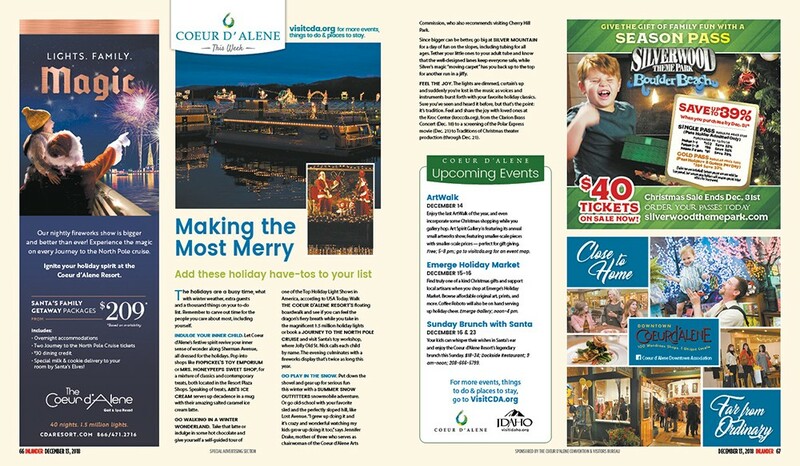 Let Coeur d’Alene’s festive spirit revive your inner sense of wonder along Sherman Avenue, all dressed for the holidays. Pop into shops like FIGPICKEL’S TOY EMPORIUM or MRS. HONEYPEEPS SWEET SHOP, for a mixture of classics and contemporary treats, both located in the Resort Plaza Shops. Speaking of treats, ABI’S ICE CREAM serves up decadence in a mug with their amazing salted caramel ice cream latte. GO WALKING IN A WINTER WONDERLAND. Take that latte or indulge in some hot chocolate and give yourself a self-guided tour of one of the Top Holiday Light Shows in America, according to USA Today. 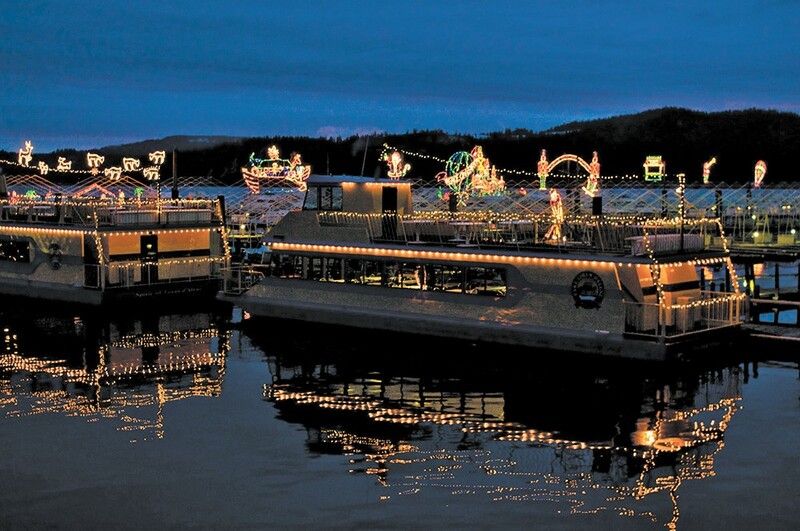 Walk THE COEUR D’ALENE RESORT’S floating boardwalk and see if you can feel the dragon’s fiery breath while you take in the magnificent 1.5 million holiday lights or book a JOURNEY TO THE NORTH POLE CRUISE and visit Santa’s toy workshop, where Jolly Old St. Nick calls each child by name. The evening culminates with a fireworks display that’s twice as long this year. GO PLAY IN THE SNOW. Put down the shovel and gear up for serious fun this winter with a SUMMER SNOW OUTFITTERS snowmobile adventure. Or go old-school with your favorite sled and the perfectly sloped hill, like Lost Avenue. “I grew up doing it and it’s crazy and wonderful watching my kids grow up doing it too,” says Jennifer Drake, mother of three who serves as chairwoman of the Coeur d’Alene Arts Commission, who also recommends visiting Cherry Hill Park. Since bigger can be better, go big at SILVER MOUNTAIN for a day of fun on the slopes, including tubing for all ages. Tether your little ones to your adult tube and know that the well-designed lanes keep everyone safe, while Silver’s magic “moving carpet” has you back up to the top for another run in a jiffy. FEEL THE JOY. The lights are dimmed, curtain’s up and suddenly you’re lost in the music as voices and instruments burst forth with your favorite holiday classics. Sure you’ve seen and heard it before, but that’s the point: it’s tradition. Feel and share the joy with loved ones at the Kroc Center (kroccda.org), from the Clarion Brass Concert (Dec. 18) to a screening of the Polar Express movie (Dec. 21) to Traditions of Christmas theater production (through Dec. 21). Enjoy the last ArtWalk of the year, and even incorporate some Christmas shopping while you gallery hop. Art Spirit Gallery is featuring its annual small artworks show, featuring smaller-scale pieces with smaller-scale prices — perfect for gift giving. Free; 5-8 pm; go to visitcda.org for an event map. Find truly one of a kind Christmas gifts and support local artisans when you shop at Emerge’s Holiday Market. Browse affordable original art, prints, and more. Coffee Roboto will also be on hand serving up holiday cheer. Emerge Gallery; noon-4 pm. Your kids can whisper their wishes in Santa’s ear and enjoy the Coeur d’Alene Resort’s legendary brunch this Sunday. $18-34; Dockside Restaurant; 9 am-noon; 208-666-5799.